Fill out the form on the right and download your Free Inspection Test Plan. You'll receive one customizable Inspection Test Plan Form. The ITP Form is in Word format so you can reuse it on each project. To learn more about completing your Inspection and Test Plan Form, read our blog article: How to Prepare Your Inspection Test Plan. Need a complete Quality Control Inspection and Test Plan? 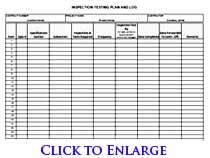 We have Inspection and Test Plan Templates complete with trade-specific inspection forms and a tutorial for you to use to complete ITP Form. Click here to see our submittal-ready Quality Control Plans for more comprehensive quality plan requirements.